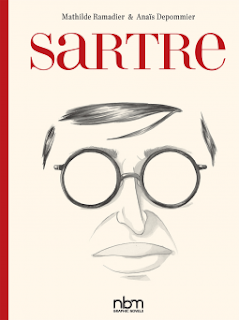 My book " Nothing"/ Customer Reviews "Barnes & Noble"
“Sartre” is a biographical graphic novel existing with a distinct creativity and authenticity. By constantly introducing the ideas, unseen aspects and feelings of the philosopher in an artistic way, the reader is seduced to an incomparable journey into the graphics and the dialogues. A delicate immediacy provides a sufficient knowledge of the life and his interior monologue, but also of the quests with the plurality of the intellectual that constituted his daily life. Contemporary reality fades, while the extensive surroundings of his interesting time amaze your senses via colorful and vibrant graphics with precision accompanied by a vivid description. A different biography, a unique approach able to entice into reading the radical life of the philosopher.